There are still no serious oversupplies in Bangkok's housing markets as of Mid 2017 unless the supplies are still increase steadily. If the supplies are controlled, the 2018 markets would be still stable. Right now the absorption is quite lower than the new supplies. Short-term speculation might not be feasible at this moment. Prices are not increased substantially. Recently, Dr.Sopon Pornchokchai, President, Agency for Real Estate Affairs (AREA) presented a latest research paper on the real estate markets in the Bangkok Metropolitan Region with reference to the the trends in 2017-8. AREA is the largest real estate information and valuation centre in this ASEAN Region. The following is a summary of this presentation. AREA conducts surveys of all types of real estate projects launched on monthly basis since January 1994. In addition, AREA also conducts surveys on the updates of sales of existing housing projects on a quarterly basis in Bangkok as well. In the latest survey in mid 2017, we found some 198 real estate projects launched during the first half of 2017. Most of them were housing projects (owner-occupied low-rise residences and condominiums). In addition, we also updated some 1,905 projects in the markets. Hence, this survey is always the largest one in Thailand. Our information is thus the first-hand information catered for real estate developers, bankers and financiers, professionals in real estate, investors and the like. AREA is very neutral because it will not get involved in real estate development nor brokerage business itself. Our integrity is that we have no developers nor bankers sitting in our board to oversee our information prior to our members. During the first half of 2017, of the total 198 projects, there were 54,389 units of all types of real estate launched at a total value of Baht 184.493 billion (USD 5.426 billion where Baht 34 = USD 1). However, if housing alone was considered, the total number of units was 54,281 units at a total value of Baht 182.647 billion (USD 5.372 billion) of the total 193 projects. It can be observed that the average size per project was 281 units in 2017, significantly larger compared to the 2016 average of 241 units. It is estimated that in 2017 as a whole, the total number of housing units launched will be 110,557 at a total value of Baht 365.293 billion (USD 10.744 billion). This implies that the number of units would be some 1.8% down from the number in 2016; whereas, the value would be down for 4.4% compared to that in 2016. Actually, during the past five months, there was a worry that the newly launched units would significantly be lower than last year. However, due to the unprecedented launching in June, the estimation becomes similar to last year. Around one-third (32%) of the products were priced Baht 2 million (USD 58,824) or below. Most of the products (65%) were priced at Baht 3 million (USD 88,235) or below. Housing units priced over Baht 10 million (USD 294,118) constituted only 3% (1,500 units) but had a value share of 15% The largest proportion of condominiums was offered at Baht 1-2 million (18% or 9,948 units). In the case of townhouses, the largest proportion was offered at Baht 2-3 million and in the case of detached houses, the largest proportion of them was priced at 3-5million. Considering the location, in Zone C1: Rattanatibet-Central, there were 3,838 housing units launched. This constituted some 9% of the total launching. There was a big worry that there might an oversupplies in this area due to the glut in the supplies. 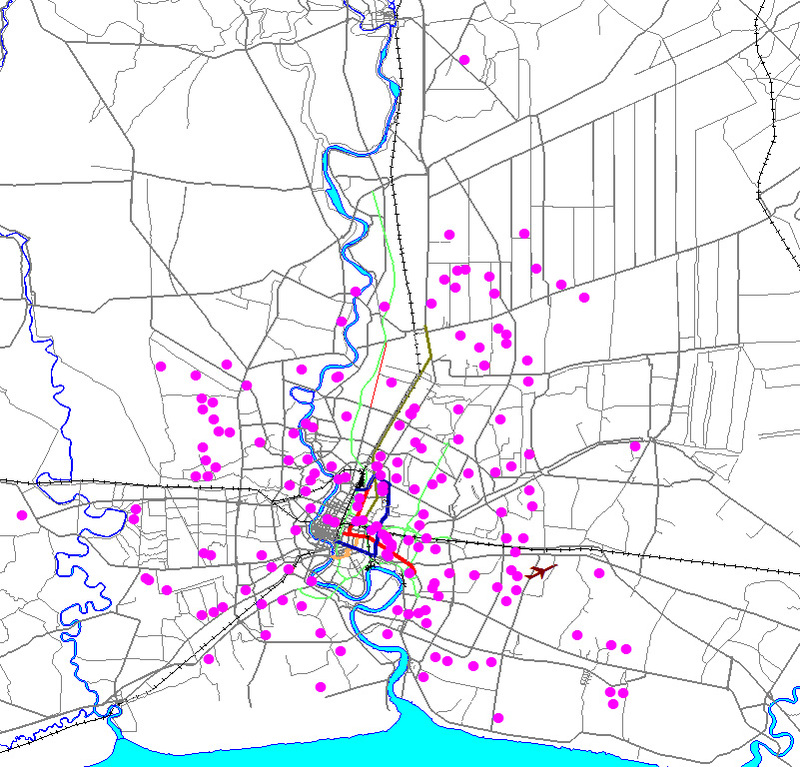 Apart from C1 which was located in the fringe, the other two locations in the fringe were also booming including Rungsit (Zone I3) and Bang Na Km.10-30 (Zone H8). However, most of the supplies were still in the hub of the cities where there were good mass transit systems. 1. Condominium units priced at Baht 2-3 million in Zone C1: Rattanatibet-Central were launched for 3,143 units or 5.9% of the total supplies. However, only 1,024 units were booked. This meant that the sales were quite slow. 2. Condominium units priced at Baht 3-5 million in Zone F2: Ratchyothin were launched for 1,723 units or 3.2% of the total supplies. Fortunately, 85% of them were booked. This was a location in an inner city area. 3. Condominium units priced at Baht 1-2 million in Zone A4: Rangsit Klong 1-7. 1,723 units were launched (2.7% of the total supplies. However, only 179 units (10%) were booked. The supplies were saturated here. As of mid 2017, there were 193,820 units still available for sale. This was increased for 5.1% in end 2016 where there were 184,329 units. The average sale price was Baht 3.365 million (USD 98,971) which was some 2.6% higher than last year (Baht 3.279 million). As mentioned, during the first half of the year, 54,281 housing units were launched; however, only 44,790 units were booked by the prospect buyers. This implies that the supplies were absorbed less than the demand to some extent. For the units which were stopped selling. It was found that there were altogether 179 projects involving with 45,499 units with a total value of Baht 117.984 billion (USD 3.47 billion). These non-performing projects were a little less than the figures in end 2016. This implies that the situation was not as bad as expected. On the whole, the 50 listed real estate companies constitute some 78% of the total new supplies in the markets in the first half of 2017. Twenty years ago, listed companies constituted only one-third of the markets. Now they are growing substantially because they have lower costs of finance. In the market, the loan interest rate is some 7%; whereas, their funds from the stock exchange cost only 3% on the average. The following tables shows the ten largest developers. 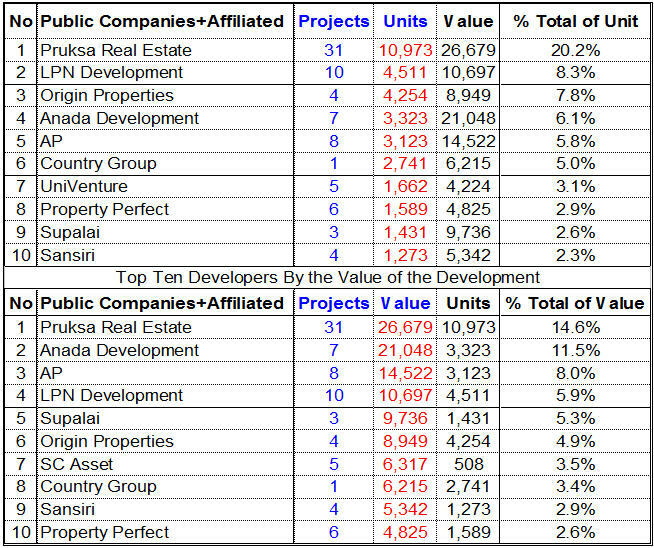 These ten largest developers constituted 64% of the total supplies or 62% of the total value in the markets. 1. As a result, there was no serious oversupply in the market except in some particular areas which should be kept an eye onto these developments particularly in Zone A4 Rangsit Klong 1-7 and Zone C1 Rattanatibet-Central. 2. The sales now is quite slow. The supplies are larger than the demand or absorption). This implies that the economy is not as good as expected. 3. Crisis will not be expected except there is no control of supplies into the markets. If there is an influx of supplies, then glut can be foreseen. 1. Supplies of larger developers in the listed companies prevail. However, no single developer can dominate the market. 2. There are some changes in foreign investors from western countries to China, Japan and Southeast asian countries. 3. Gimmicks of new developments include larger and beautiful common areas, co-working spaces, greenery and gardening, party areas and the like. 4. Household debts are still a burden for future buying of real estate. 1. Roadshow should be in neighbouring countries rather than western countries which are located afar from Thailand. 2. Locations along mass transit still possess high potential for developments. 3. Alternative locations in Thailand could be the region of the Eastern Economic Corridor (EEC) because Bangkok might have some potential for oversupplies. 4. Investing and developing real estate projects abroad should seriously be considered particular in Indo-china, Indonesia and the Philippines where the studies of AREA confirmed the high potential there. On the whole, a detailed study with scrutiny is important for reliable decision for development of new projects. In additon, frequent following up and evaluation are also needed to ensure the success as well.